I am currently working on a new game and I started working on the world map. 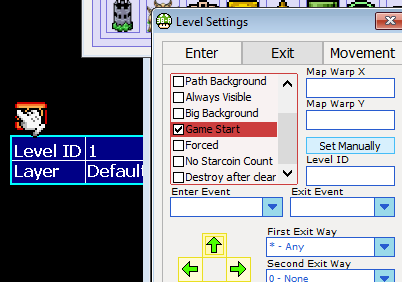 I made the first two levels and the start pad but whenever I start the game up in smbx I receive an error saying that there are multiple starting points. Can someone please help me out with this error? I linked a file of the world map below. Thx man! All of the tutorials that I saw online were for 1.3.0.1 so it was kind of confusing. Again thx. I'm sort of new to SMBX. I ran into the same error message about multiple Start points. I'm not exactly sure what qualifies as a Start point, but I get this error even after I remove ALL tiles from the Levels tab. I tried to follow your solution, but I don't know where to find the menu you have pictured.